An essential aspect of rooms, furniture nodes are mounting points for furniture item, the position a chair might appear when added to a scene. In Blender they will generally be linked to the rooms root bone, skeleton.Room, and are included based on the degree of interaction a room is to have (what avatars can do). Normally arranged in a grid pattern, they can also be randomly placed where needed, on a cliff face for example. And although they are needed for furniture, not all node types need be included, omitting ceiling nodes from an outdoor scene for example. 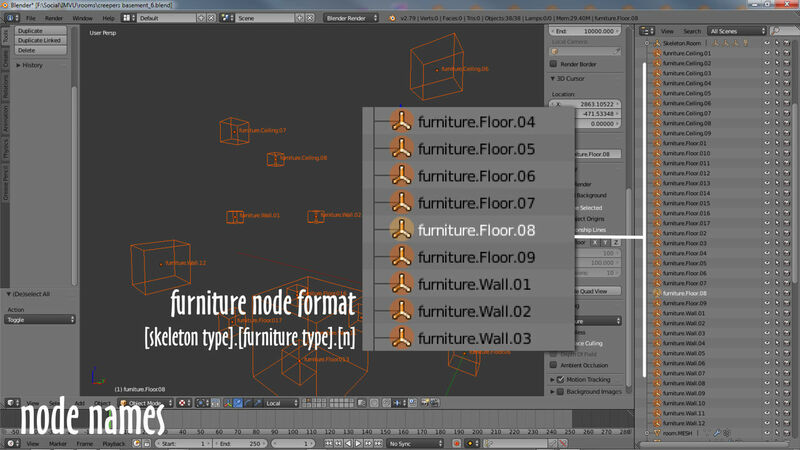 With the availability of FBX furniture rooms can be made using nodes, an Empty in Blender, and/or/in combination with, Armatures (one) and Bones (multiple). Even relatively small rooms can contain a fair number of furniture nodes depending on the level of interaction desired, although not all types needs to be included. Generally speaking floor (*.Floor) nodes are used for furniture that should appear upright on surfaces, seats, benches, couches etc. ; wall (*.Wall) for furniture appearing on walls or orientated to face inwards/outwards, suitable for windows, pictures, mural hangings etc. ; and ceiling (*.Ceiling.) for furniture hanging from ceilings, pointing down into rooms, or from ‘upside-down’ surfaces, lamps, light fittings and so on. 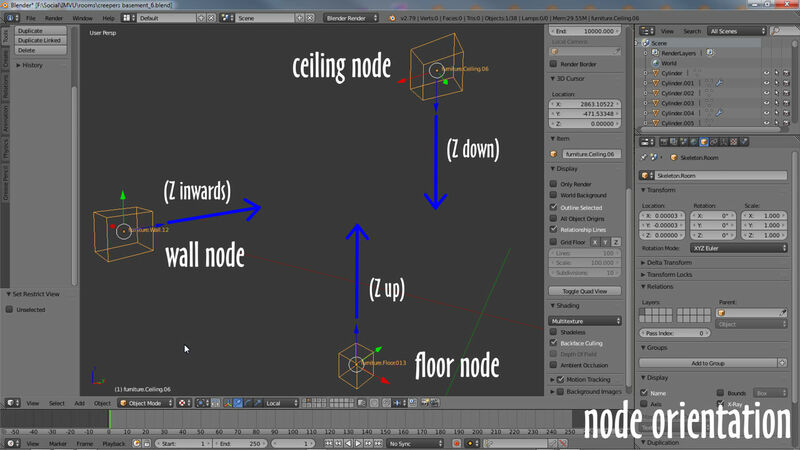 In Blender, and generally, the Z axis is import for determine the orientation of nodes per-type but they can be rotated and spun to match the surfaces they might represent, a consideration more useful for floors and walls, nodes that might need to match the contours of a ground surface or brick wall for example, than ceiling . Each node type faces a particular direction to match behavioural expectations for furniture items mounted to those points – a chair dropped onto a ceiling node will be upside-down for example. Numbers can be written as 01 » 09, 10 » 999 (01 … 09, 10, 11 … 99, 100 … 999) or 01 » 09, 010 » 999 (01 … 09, 010, 011 … 099, 100 … 999), and must be preceded by a period/full stop. Although it’s technically possible to include 999 or more nodes in a room, IMVU recommends no more than 650. The names or labels given to each node is based on what they do and where they are located in the rooms overall skeleton – this distinguishes walls from floors and furniture from seats. For standard furniture rooms all furniture nodes need to be linked to the rooms origin, skeleton.Room. This is done through the use of Parent in Blender. First select the furniture nodes to be connected using (Shift+) right-click then skeleton.Room – this must be selected last. 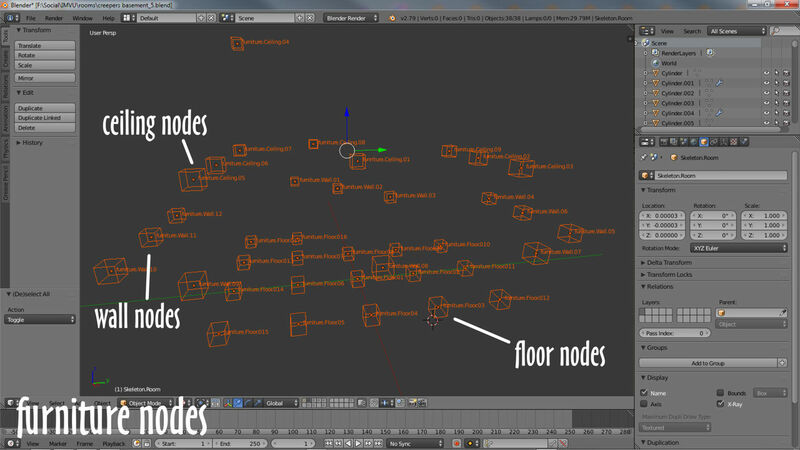 Once the nodes are highlighted, from the Object menu choose Parent » Object, then Object (Keep Transform) from the Set Parent To pop-up that appears, this links everything together so skeleton.Room now influences the furniture nodes. The order in which the nodes are selected is important, skeleton.Room must be last (it will highlight a slightly brighter colour than other nodes in the group to indicate this) – skeleton.Room is the ‘parent’ object furniture then being its ‘children’. 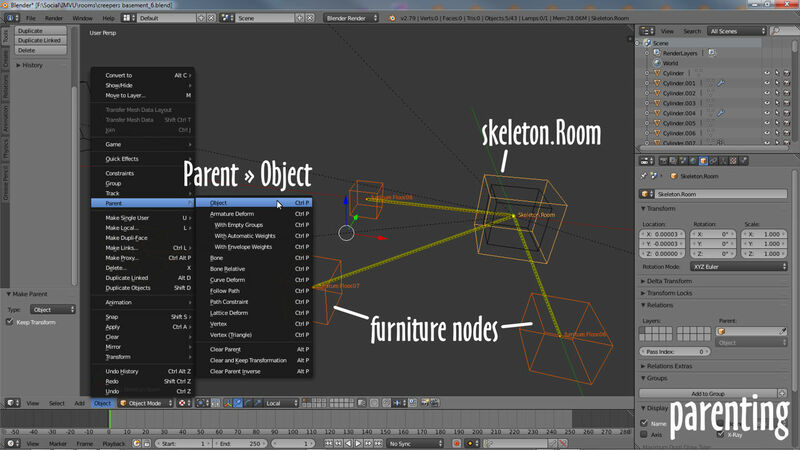 Once furniture nodes are positioned they need to be linked to skeleton.Room using Parent – select the nodes, skeleton.Room last, then from the Object menu choose Parent » Object, then Object (Keep Transform).